When an abortion service started in Invercargill last year, anti-abortionists quickly mobilized against it. An anonymous e-mail was to sent to the Abortion Law Reform Association NZ threatening ALRANZ and clinic staff: “People who work at the clinic are legitimate targets and so are you. You’ll be hearing from me again, that is if your computer, or in fact your premises, are in one piece”. Disgustingly, Bill English, whose electorate is in Southland and who is an antiabortionist himself, refused to condemn such threats of violence. Threats by antiabortionists and support for their actions from politicians are sadly nothing new. 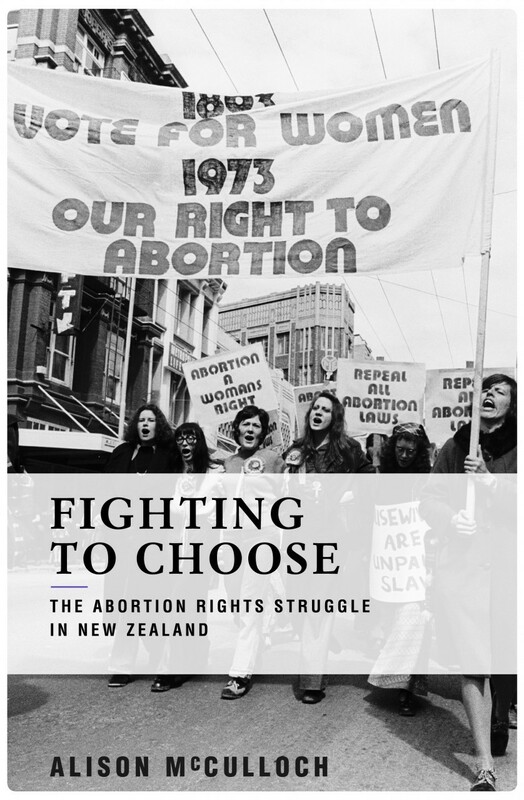 As feminist author and journalist Alison McCulloch meticulously documents in Fighting to Choose: The Abortion Rights Struggle in New Zealand, threats, violence, arson and bomb attacks have always been mainstays of anti-abortion campaigning. Arson was the fate of the very first abortion clinic Auckland Medical Aid Centre, opened in 1976. Fighting to Choose is a tribute to the heroic women and men who fought for the pro-choice platform that we take so much for granted today. Against all the odds, pro-choice activists took on the 95% male government, a conservative medical association, the media, the Catholic Church, and a rabid antiabortionist organisation SPUC. While they did not manage an outright victory, pro-choice campaigners forced concessions to enable women greater access to abortions. The number of women who have safe abortions in New Zealand today is a testament to this partial victory. If Fighting to Choose is a tribute, it is also an intervention in an ongoing fight to decriminalize abortion. McCulloch offers an honest appraisal of the contradictory situation women face today: the failure to decriminalize abortion on the one hand, but the reality that, however demeaning, cumbersome, and time-consuming the process, women have greater access to abortion now than ever before. Fighting to Choose is an absolute must read for anyone interested in abortion and reproductive justice. But more than this, the book offers lessons for women fighting to decriminalize abortion today. Should we focus on street marches? Do we prioritise lobbying politicians and other respectable members of the public? Should activists tone down the message of “women’s right to choose” and make it an issue of “health and safety”? These are all questions that have ongoing relevance and are thoroughly examined in McCulloch’s book. It is a little-known fact that the slogan ‘abortion on demand’ was propagated by the antiabortion camp to paint pro-choice activists as ‘extremists’ and to keep these activists on the back foot. In doing so, Spuc could claim the moral high ground. McCulloch writes that this strategy “was one of Spuc’s major successes. And it was a success Wonaac and other pro-choice groups did not – and arguably have not – managed to fully counter’. Another strength of this book is the way in which the abortion rights campaign is contextualized within the wider women’s liberation movement. Pro-choice activists “cut their political teeth opposing the Vietnam War, racist rugby tours, environmental degradation and even rules against mixed flatting. Universities were the incubators for much of this political activity, and more and more women were enrolling”. Just because you were active in women’s liberation, it didn’t automatically mean that you would be pro choice. Co-founder of National Organisation of Women, trade unionist and campaigner for equal pay, Connie Purdue’s history shows contradictory consciousness. In the first United Women’s Convention in 1973, Purdue and 25 other antiabortion supporters walked out of the convention in disgust as the majority of the 1500 women present voted in favour of a pro-choice platform. Thirty-six years after the Contraception, Sterilisation, and Abortion act became enshrined, these warnings from Cisler are almost prophetic in the way she describes our current situation. The compromises, the look towards incremental changes has produced a law that is riddled with ambiguity, and which no lawmaker wants to touch because it is too “controversial”. Future pro-choice struggles must be absolutely, unapologetically for a woman’s right to choose. But this struggle must also be a struggle for genuine women’s emancipation, one that challenges the very logic of a system that degrades women’s unpaid and unappreciated work in the home, a system that benefits from women getting paid less than men, and a system that is sexist to the core. Alison McCulloch’s fantastic, activist history contributes to that struggle.